One of the most celebrated of all tropical fruits. Native to Asia, this long lived attractive evergreen tree will reach 3-7m height and width. Delicious juicy Summer fruit that can be eaten fresh, juiced or used in cooking. 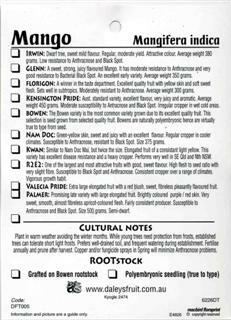 • IRWIN: Dwarf tree, sweet mild flavour Regular, moderate Yield Attractive colour Average weight 380 grams. Low resistance to Anthracnose and Black Spot. 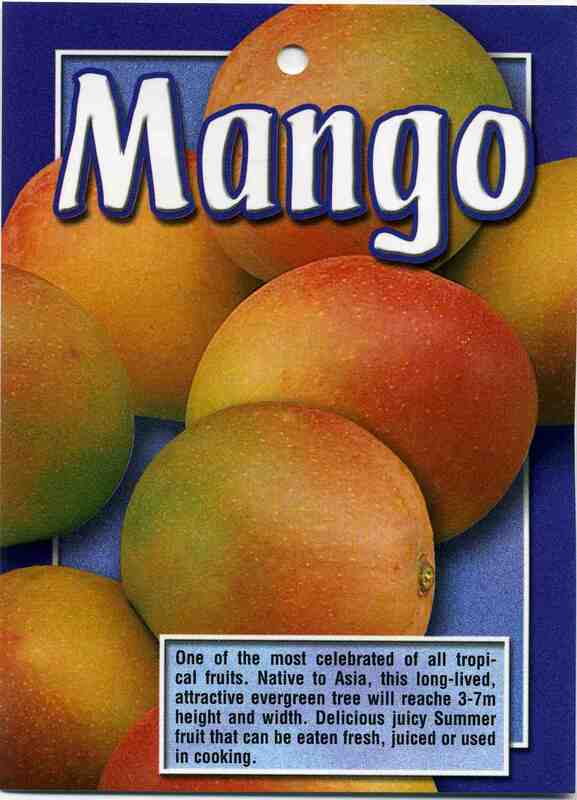 • GLENN: A sweet, strong, juicy flavoured Mango. It has moderate resistance to Anthracnose and very good resistance to Bacterial Black Spot. An excellent early variety. Average weight 350 grams. .
• FLORIGON: A winner in the taste department. Excellent quality fruit with yellow skin and soft sweet flesh. Sets well in subtropics. Moderately resistant to Anthracnose. Average weight 300 grams. • KENSINGTON PRIDE: Aust. standard variety, excellent flavour, very juicy and aromatic. Average weight 450 grams. Moderate susceptibility to Antracnose and Black Spot. Irregular cropper in wet cold areas. • BOWEN: The Bowen variety is the most common variety grown due to its excellent quality fruit. 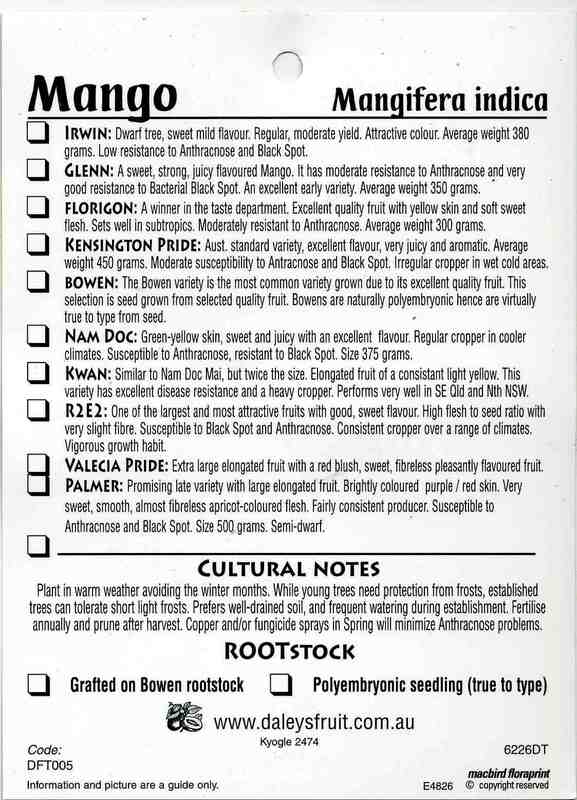 This selection is seed grown from selected quality fruit. Bowen's are naturally polyembryonic hence are virtually true to type from seed. • NAM DOC: Green-yellow skin, Sweet and juicy with an excellent flavour. Regular cropper in cooler climates. Susceptible to Anthracnose, resistant to Black Spot. Size 375 grams. • KWAN: Similar to Nam Doc Mai, but twice the size. Elongated fruit of a consistent light yellow. This variety has excellent disease resistance and a heavy cropper. Performs very well in SE Old and Nth NSW. • R2 E2: One of the largest and most attractive fruits with good, sweet flavour. High flesh to seed ratio with very slight fibre. Susceptible to Black Spot and Anthracnose. Consistent cropper over a range of climates. Vigorous growth habit. • VALENCIA PRIDE: Extra large elongated fruit with a red blush, sweet, fibre less pleasantly flavoured fruit. PALMER: Promising late variety with large elongated fruit. Brightly coloured purple / red skin. Very sweet, smooth, almost fibre-less apricot-coloured flesh. Fairly consistent producer. Susceptible to Anthracnose and Black Spot. Size 500 grams. Semi-dwarf. Plant in warm weather avoiding the winter months. While young trees need protection from frosts, established trees can tolerate short light frosts. Prefers well-drained soil, and frequent watering during establishment. Fertilise annually and prune after harvest. Copper and/or fungicide sprays in Spring will minimize Anthracnose problems.